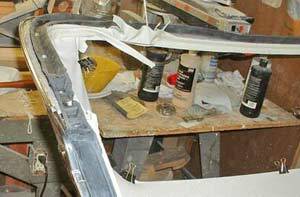 T-Bird Car Restoration Project Part 6 — Two in One! 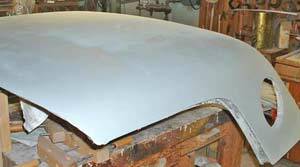 You are no doubt going to ask why, in the depths of disassembly, did we decide to restore the hard top on our '55 T-Bird car restoration project? There are two answers to this question: first, the top was in the way and we thought that a brief turn of our attention to restoring it would allow us to move it inside the house. Second, it is in the depths of disassembly (that time when it appears nothing will ever be finished) that a psychological uplift is needed. 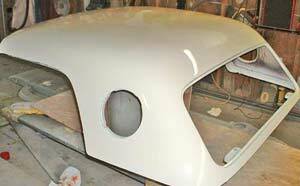 What better uplift than a finished, painted, trimmed hard top to look at? Where we started...the inserts show some of the sordid details. That was our thinking and — in spite of the nearly 60 hours of work it took — we're glad we tackled the hard top. It looks beautiful now, a far cry from what we started with. 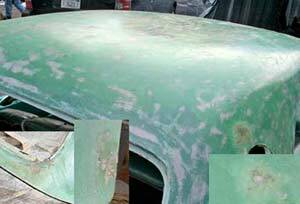 The fiberglass top had seen hard times during the past 49 years and someone had attempted repairs in an amateurish way. Internal parts were improperly attached and the top surface was coated with a poured-on, 1/4-inch layer of semi-cured resin in a botched effort at re-glazing. The first step in the restoration was to pry loose the front edge of the top and re-weld it with new resin. We took lots of measurements and test-fitted the front trim several times to assure correct placement, then mixed resin and set the piece in place. 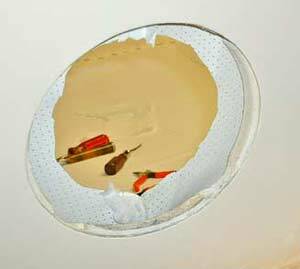 Once cured, we touched up the corners with filler and re-glued the side pieces and porthole openings with fresh resin. We test-fitted the rear window at this point to make sure all the dimensions were correct. The front edge was set in place with judicious use of clamps and wood blocks. We test-fitted the rear window to check out the dimensions. That led us to the top surface. There was no choice but to remove the gooey, uncured resin. 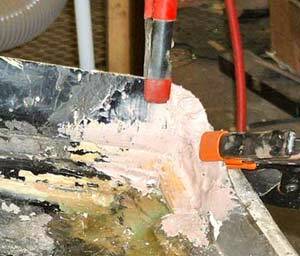 We contemplated using chemical stripper (too many applications would be necessary) and several mechanical means, but after some testing we found the most efficient method was a belt sander with 36-grit belts. It took a couple hours and nine (9!) sanding belts to get the mess off the original top surface. 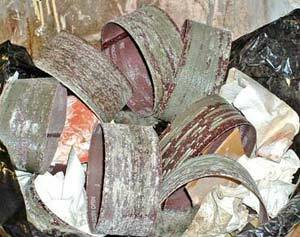 Notice how loaded the used-up belts are with melted resin. From that point we sanded the top surface as smoothly as possible. Hundreds of "desert-like cracks" were revealed in the original gel coat so we spread a layer of body filler (mixed with a little liquid resin to make it flow into cracks better) over everything to act as a new coating layer. 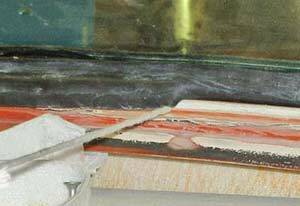 Once that layer was cured we sanded the top smooth, first with 80-grit and then with 150 grit paper. Even the raw layer of filler looks better than the old resin layer did! At this point we took the top to the garage and prepared it for a coat of filler-primer. Wipe-down's with mineral spirits and enamel reducer were followed by drying and a final wipe with a tack rag before spraying the filler-primer. We then sanded the surface with 220-grit paper and touched up any imperfections with glazing putty and then sanded again with 400 grit paper. 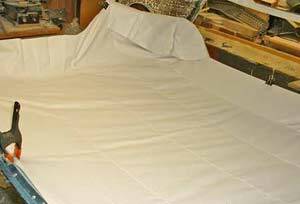 We then repeated the cleaning processes and shot four coats of the final white color and allowed it to cure for several days. By the way, we didn't show the actual painting process. That will come later when we paint the car itself. It's got a generous coat of filler-primer and is ready for sanding. Now we're starting to feel that psychological boost we were looking for. Things went okay to this point, so we color-sanded and buffed the new white finish to remove "orange peel" and minor imperfections. 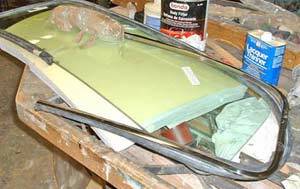 It was much easier to do this right away so that the stainless trim, rear window and portholes could be installed and not harmed later by getting too close with the buffing compounds. 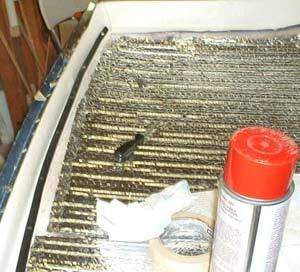 The top was flipped on its back (nestled on a soft blanket and foam pads to prevent scratching the paint) so that we could start installation of the headliner, but first we wanted to line the inner surface with insulation and sound deadening material. We bought some rolls of aluminum foil insulation from the local home center. It's two layers of thick foil bonded to a bubble-wrap inner core and has several important properties: 1) it's thin and flexible; 2) it adheres well to contact cement; 3) it is a great insulator; 4) it deadens sound; 5) it cuts with scissors and razors; and 6) it's cheap! We simply placed sections of the material on the surface to be lined and cut it to fit with a razor blade. Once all the pieces were cut and test-fitted we sprayed them with contact cement and lined the top's inner surface in short order. Then it was time to install the tacking strip for the headliner. The first piece of insulation is laid in for fitting. With the liner in place we start drilling holes for the installation of the black tacking strip. The dense, black rubber tacking strip had to be drilled and countersunk for each attaching screw. A hole for the screw also had to be drilled into the fiberglass inner structure, and this had to be done 70 times around the perimeter of the top's underside. It took a long time but we were rewarded with a strong mounting point for the headliner. At last, the tacking strip is in place. Installing headliners is nowhere near as hard as most people think it is. The only "secret" is to be patient and not afraid to stop, pull it out and start over. In the case of our hard top, of course, the task was simpler in two ways: first, the top area is relatively small; and second, we could work on it looking down rather than looking up. To start, we unwrapped the new headliner and placed it out in the sun for a couple hours to straighten out all the fold creases. We then slid each of the four bows through its respective cloth channel on the reverse side. 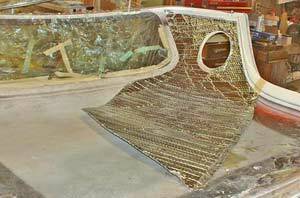 Once the bows were inserted we spread out the headliner to position it centered in the top. Notice that we put a little masking tape on the end of the bow so it wouldn't tear the cloth channel. We worked from front to back (no reason) inserting the bow end into their retaining holes in the top structure. As we got to the rear of the top we continued to spread out the headliner and double-check its fit all around. The last bow was fitted into its retainers and we could start stretching. You have to bend the bow to get it into the slot. The bow is now fixed where it should be. 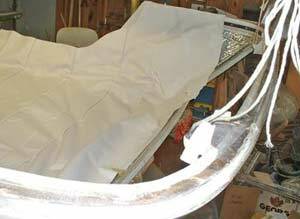 With the bows in place we started pulling each end of the headliner from its centerline. As we stretched the fabric we held it in place with clamps and paper clips. After a few minutes we were rewarded with a well-stretched headliner, at least front-to-rear. The headliner is beginning to look like it'll fit. Stretching and pulling to remove the wrinkles just takes time and patience. Starting at the front bow we stretched and pulled the headliner to the side. 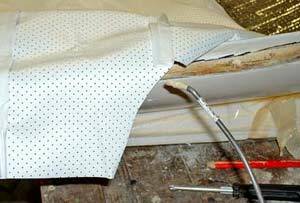 We then stapled the fabric into the tacking strip, at first just where the seam was located. 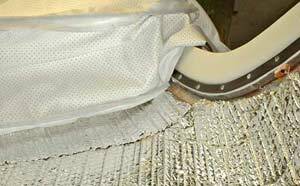 We worked our way from seam to seam, stretching the fabric to remove all puckers and droops. 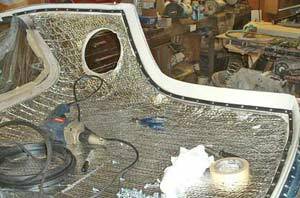 The bows hold the seams in place, so once it's stretched the headliner starts to take shape. You can see where the droops still remain, so the trick here is to remove some staples and keep pulling. Our headliner installation was complicated a little by the portholes. These openings required that we cut the fabric that covers the hole, then stretch it into the opening and glue it in place. 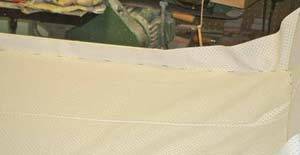 We cut out a small hole in the center area and made slits so that we could pull the fabric tightly. 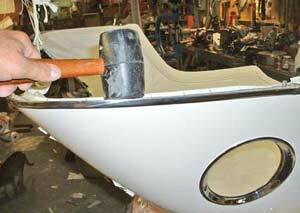 A quick spray of glue on the proper areas and we were on the way to a finished porthole. Once the edges were glued we covered them in masking tape to hold until the port hole components were installed. Don't cut too much away or you won't have enough to cover. 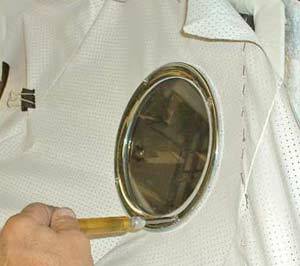 Fastening the pieces of the finished porthole trim. Next came the rear window opening. 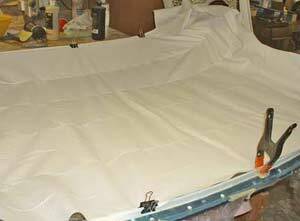 The headliner fabric was stretched and held in place at the window flange by several clamps. We then glued the fabric onto the flange and cut off the excess. 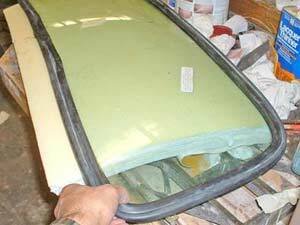 This is how nearly all headliners are attached to rear windows, which means the window, with its rubber gasket and stainless trim) must be removed first. 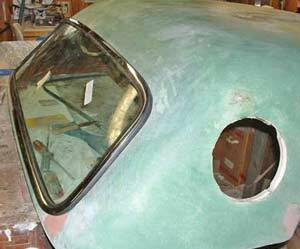 The rear window then had to be reassembled with its gasket and stainless and then fitted to the top. Cutting away the excess material once the glue dried. Getting all the pieces ready for assembly. The trick to installing windows is to insert a strong piece of twine (nylon is best) into the rubber channel that will surround the body flange. Arrange it so its ends can be pulled from the center of the top and bottom. Once the window is placed gently over the opening — and held by a helper from the outside — you can go inside and gently pull the string. As you pull the rubber will fold out over the flange and fasten the window to the opening. In this case, of course, it holds in the headliner edges as well. It's ready to put into the top now. Our top was nearly done, but we still had to install a wire-on strip (this is a piece of finishing material that hides the staples and tacks along the edge of the headliner) to the inside of the top and then install all the rubber gasketing along its bottom (this is a removable hard top, so there's lots of weatherstripping to keep out the rain). Pulling the string, ever so carefully, pulls the rubber channel out over the body flange. A bit of the gasket is now in place. It's looking more and more like a new hard top. 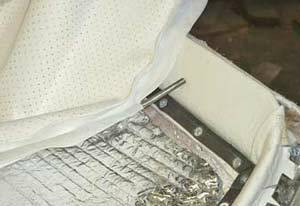 We still have to install four of the hold-down clamps that secure the top to the body, but we don't have them back from the chrome plater. 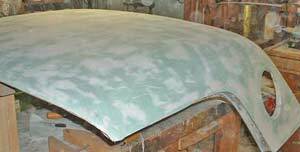 We also have to steam out the remaining wrinkles in the headliner but this is a waste of time until the top is actually fastened to the car's body, due to the overall flexibility of the top. For now, however, the top is going to get covered in plastic and stored safely away.